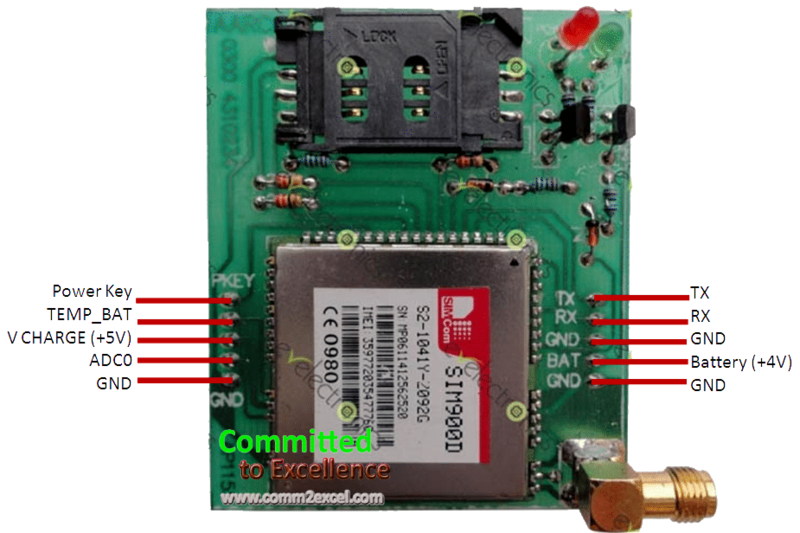 The SIM900 is a complete Quad-band GSM/GPRS solution in an SMT module which can be embedded in the customer applications. Featuring an industry-standard interface, the SIM900 delivers GSM/GPRS 850/900/1800/1900MHz performance for voice, SMS, Data, and Fax in a small form factor and with low power consumption. With a tiny configuration of 24mm x 24mm x 3 mm, SIM900 can fit almost all the space requirements in your M2M application, especially for a slim and compact demand of design. 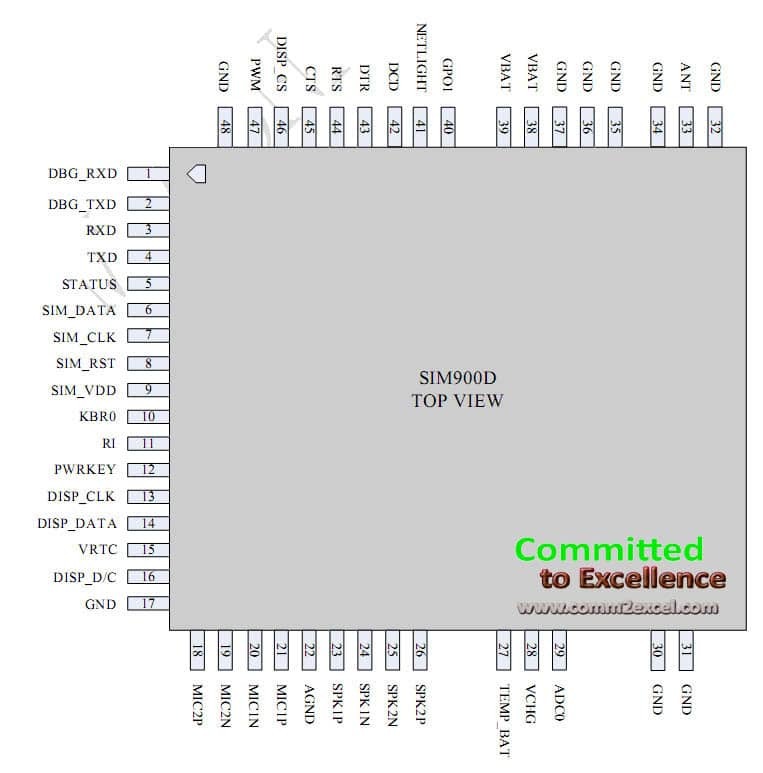 SIM900 GSM Module comes with TTL Serial Port interfacing, which makes it easy to interface it with any microcontroller. 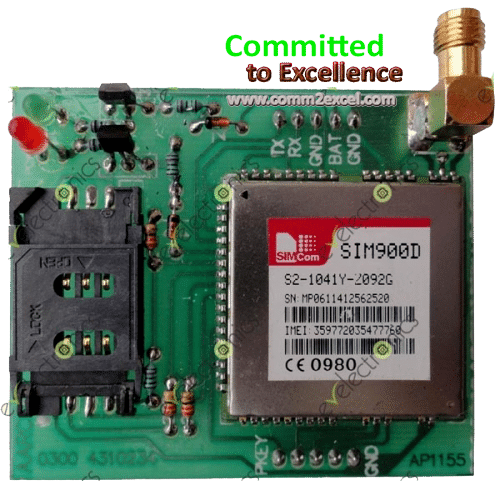 However SIM900 comes in QFP (Quad-Flate Package), it is difficult to solder it at home, So we have bought SIM900D GSM Board from evselectro.com. But there is a little problem in this GSM board, that the MIC and SPEAKER Pins of SIM900D GSM Module are not connected to any connector on board, they remained NOT CONNECTED. So this module can only be used for interfacing it with devices, which only require SMS and GPRS Facility. No, any voice capability. It is necessary to connect 4 Volt Battery to BAT Terminal, to function properly. If you connect Power Supply, it might not work properly with a Power supply of lower than 3 Amperes 3.5v to 4.5v. We have connected Battery of 4V and 7Ah. To turn ON the module, connect GROUND with PKEY for at least one Second and then leave it unconnected, check Module LEDs. One LED will remain ON and other will blink continuously. PKEY Ground it for one second to turn it ON and OFF and then leave it unconnected. 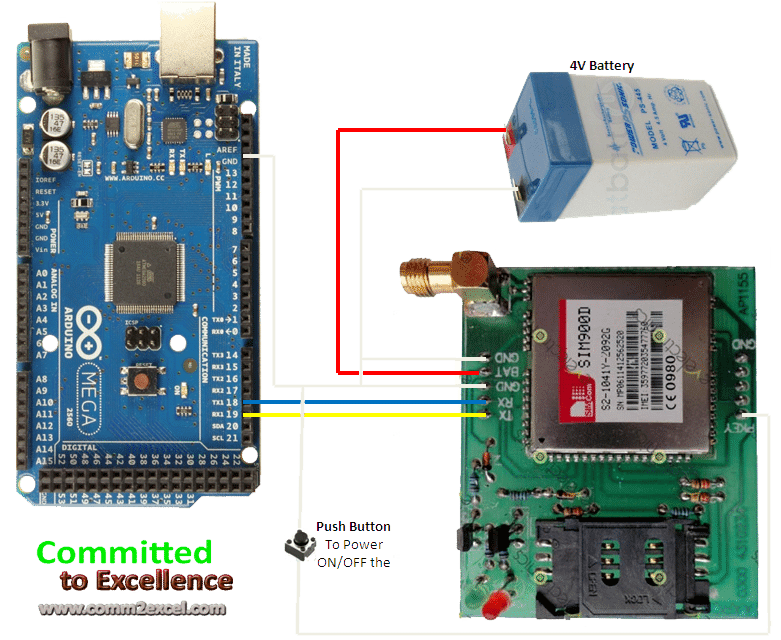 The Code below is used to connect Arduino with SIM900D GSM Module Board, with Manually entering AT Commands using Serial Monitor window of Arduino. To check if the connections are correct, send AT-Command using Serial Monitor, if the reply is OK then the connections are OKAY. And Device is functioning correctly. – If you connect SIM900D GSM Module Board BAT Terminal directly with External Power Supply of 4 volts (or in range from 3.5v to 4.5v), and turn ON the module by pressing POWER KEY (turning PKEY low or connecting it with GROUND for one second and then releasing it OPEN CIRCUITED), will turn ON the module, the LED will turn ON and will turn OFF while other LED will turn ON and first LED will start blinking. And might turn OFF if SIM is inserted in Socket of the board. – Or with External Power Supply of 4v, the board may turn ON, but when you send any command which functions with SIM like Sending SMS, Making a call or any other call at SIM may cause it turn off. 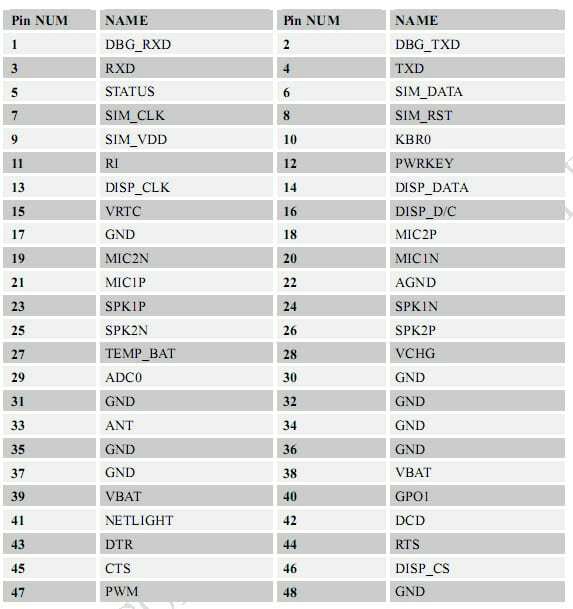 Because when SIM is activated, it requires at least 2A current, if Adapter will not provide sufficient amount of Current then module will turn OFF.